A top NBC sports executive producer said that the network planned on airing coverage of national anthem protests, if they happen, during the NFL’s upcoming Super Bowl LII. “The Super Bowl is a live event … and when you’re covering a live event, you’re covering what’s happening. So if there are players that choose to kneel, they will be shown live,” said Fred Gaudelli, via Adweek, at the Television Critics Association winter press tour. 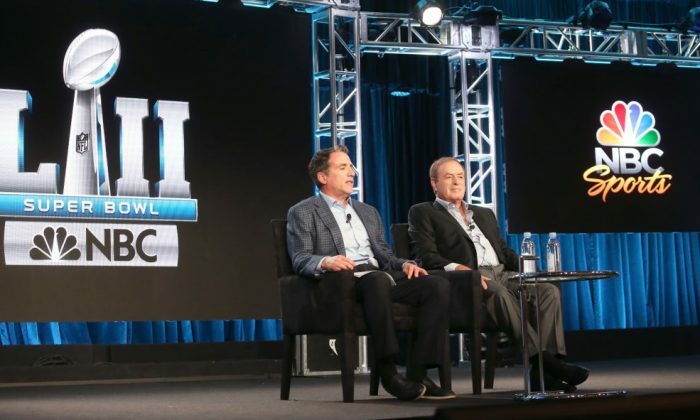 When asked about empty stadiums and diminished television viewership, Gaudelli and sportscaster Al Michaels cited other reasons. “Obviously, you can watch the game anywhere on any device there is. If your team isn’t having the season you’d hoped they have, if the weather is bad…I think there are a lot of factors and to pin it on one thing I think is erroneous,” said Gaudelli at the meeting, via Variety. “Most of the seats in most of the stadiums have been sold, but you go to Atlanta, where they just opened up a new stadium. They have behind the lower bowl a 100-yard almost mall. You’ve got stores, you’ve got bars, you’ve got restaurants, you’ve got games for the kids,” added Michaels. The NFL anthem protests have been a source of contention since they began in 2016. Former 49ers quarterback Colin Kaepernick credits his initiation of the protests with his current inability to gain employment in the NFL and has tried to take legal action. Within the NFL, the protests have been a source of confusion for management, players, and players organizations, who have expressed different ideas of how to handle the issues they have brought up. Opposition to the protests comes down from the highest level of government. President Trump has expressed his disapproval via Twitter and in speeches. NFL Commissioner Roger Goodell hasn’t publicly taken a definite stance on the protests. The Super Bowl could reveal a larger picture of how the protests have affected the NFL’s image, at its largest yearly event.